inside access to the cast, filmmakers and more! “Cars 3” surged to the front of the pack opening weekend with audiences racing to see the legendary Lightning McQueen (voice of Owen Wilson) and spirited trainer Cruz Ramirez (voice of Cristela Alonzo) team up to beat the new generation of blazing-fast racers. Now, this summer’s high-octane hit cruises home—loaded with bonus features like the all new mini-movie starring the demolition derby legend Miss Fritter— Digitally in HD and 4K Ultra HD™ and Movies Anywhere on Oct. 24, and on Blu-ray 4K Ultra HD™ and Blu-ray™ on Nov. 7. Race fans of all ages are invited to ride along with the “Cars 3” crew for hilarious and heartfelt extras, including an exclusive new mini-movie, “Miss Fritter’s Racing Skoool,” taught by the queen of the Crazy 8; a feature detailing how real-world race training influenced filmmakers; the journey taken by voice actor Cristela Alonzo and team while shaping tech-savvy trainer Cruz Ramirez; behind-the-scenes access to the story team who crafted Lightning McQueen’s third chapter; deleted scenes; and much more. 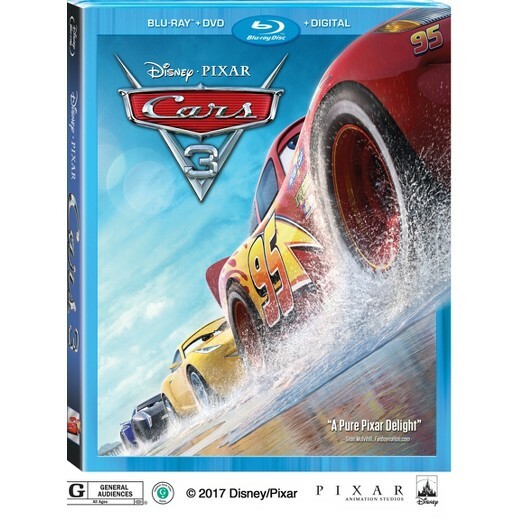 Be sure to add CARS 3 to your Movies Anywhere Digital Library today! Own “Dunkirk” on 4K Ultra HD, and Blu-ray combo pack and DVD on December 19, or Own It Early on Digital HD on December 12!